Five members of the Gareylab visited San Salvador island in the Bahamas March 12-17 2019. This was our 3rd trip in 5 years. We went with Dr Bogdan Onac with a group of Geoscience undergraduates for the field karst course. Madison Davis, Bobby Scharping, Chelsea Dinon, Meghan Gordon, Josie Knieriemen and Dr. Garey were there. We learned a lot about the karst geology of the island through 5 days of field trips and focused on a continuing project studying three blue holes at the south end of the island: Inkwell, Church, and Watling’s blue holes. Bobby and Chelsea placed the ADV and Hydrolab in Watling’s Blue Hole while Dr Garey and Meghan collected water and sediment samples at Church Blue Hole. On the second day of diving, the entire lab participated in a thorough sampling of Inkwell. 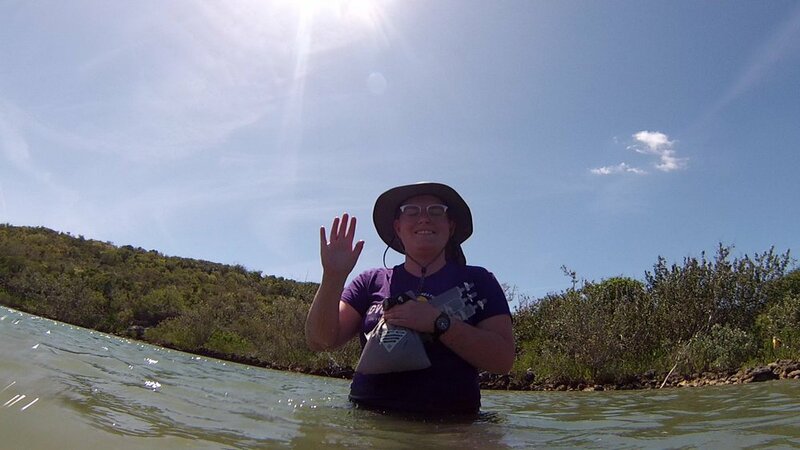 Along with the hydrochemistry, we will be doing microbial community workups on the blue holes to follow up on a manuscript currently under review from our last San Salvador trip.